Get the help you deserve and let us take care of the process every step of the way. 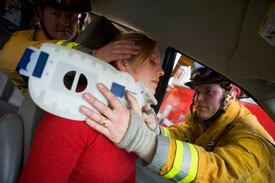 If you have been in an auto accident, you most likely have some type of soft tissue damage in your neck, back or both. This could result in significant pain and stiffness in the days following the accident. It’s important to get checked right away and begin a treatment program to prevent long term injuries. Chiropractic care is a safe and natural treatment option following an accident. Dr. Monbarren has been helping patients who have been involved in car accidents for over 25 years. What type of injury do you treat? Whiplash is one of the most common injuries sustained in a rear end collision. In this injury, the impact throws your body forward and back resulting in micro-tears in the soft tissues of the neck and back. Symptoms can include stiff neck, back pain, dizziness, headaches and overall stiffness and aching. If your injury is a result of an accident, we will help you fill out all appropriate forms and submit the bill directly to the insurance company. All you must do is diligently follow the treatment plan Dr. Monbarren recommends for your injury. On your first visit, Dr. Monbarren will conduct a thorough exam and consultation. X-rays may be necessary and based on an individual case. Treatment plans consist of a combination of manual manipulations and therapies.